Invisalign in The Colony Is Perfect for Mature Patients! If you’re an adult with a crooked smile, all hope isn’t lost. Getting the straightening treatment that your smile really needs is still attainable with Invisalign in the Colony. That’s right, you can get the orthodontic treatment that you want without needing brackets and wires! Learn more about this modern, discreet way to achieve the smile of your dreams from this week’s blog post. As mentioned above, all hope isn’t lost if you’re an adult that wants a straighter smile. In fact, teens and adults are the perfect people to truly benefit from the Invisalign treatment. Why? Children’s mouths are still developing while older folks don’t have to worry about their smile changing. Are your teeth free of tooth decay and damage? Are you committed to good, long-term oral health? Do you desire to fix the crooked teeth, gapped teeth, and/or crowded teeth in your mouth? Are you regimented enough to wear your aligners for at least 22 hours a day? If you’ve worked hard to earn that polished, matured appearance and don’t want traditional braces to blemish your perfect appearance (besides flawed teeth), Invisalign may be for you. 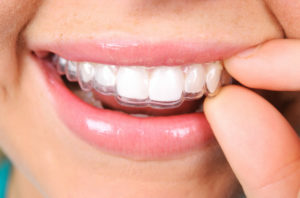 Invisalign clear braces use a series of practically clear, gentle, plastic aligners to straighten your teeth. Your cosmetic dentist in The Colony create aligners that are personalized to address your dental concerns. They apply a constant, comfortable pressure to guide teeth into their perfect positions. You wear each set of aligners for about two weeks, removing them only to eat, drink, brush, and floss. As you replace each aligner with the next in the series, your teeth will move gradually until you have the straight smile you’ve been dreaming of. When you choose Invisalign, you can achieve faster results than any other traditional orthodontic treatment! The process isn’t just much faster either, you can benefit from Invisalign in all these other ways! Your confidence will soar compared to when you had a smile that you used to actively hide. You experience comfortable straightening from personalized aligners rather than forceful brackets and wires. You can still enjoy your favorite foods because you can remove your aligners to eat. You can keep your dental routine just about the same, just adding a few minutes to clean your teeth. If you’re excited about the possibility of straightening your teeth—even as an adult—it’s time to contact your local office! Here at Ridgepointe Dental, we know that there are many adults that wish they had straighter teeth, but just don’t know how to go about getting the treatment they need without embarrassing themselves with metal brackets and wires. You can be confident that your dentist here in our office is here to find a solution for you that fits your needs. Learn more by contacting our office today! Comments Off on Invisalign in The Colony Is Perfect for Mature Patients!